Editor’s Note: Mike Godwin is an American lawyer working on Internet freedom and Internet laws and policy for over two decades in various parts of the world, including Cambodia. Currently a distinguished senior fellow with the R Street Institute and a freelance consultant, he recently sat down for an interview with VOA Khmer’s Say Mony in Washington D.C. about the current state of Internet freedom in Cambodia following the government’s crackdowns on political speech on the Internet and on independent and critical media and opposition voices. VOA: I know you have been involved in the field of Internet freedom around the world for over 25 years now including your time in Cambodia in the past few years. 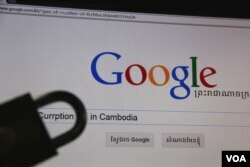 Internet freedom in Cambodia was rated “partly free” last year, according to Freedom House. So, can you tell us about the situation of Internet freedom in Cambodia right now, especially following the government’s recent crackdowns on the independent media and opposition voices? Godwin: Certainly. After my visit to Cambodia in 2015, I had been quite optimistic that the progress for Internet freedom in Cambodia would continue. I continue to be engaged with Cambodia as my wife is from Cambodia. I’ve watched with her and her family as there’s been some concerns that because of the government’s criticism of traditional media coverage and its more tense relationship with independent media organizations that there may be some efforts to shut down or to limit Internet freedom. I follow the Cambodian Center for Independent Media. I try to keep up with news developments and we know that certainly there have been some efforts by the government to arrest or criticize people who have used the Internet to criticize the government. So, we’re concerned about that. But, it’s a little more difficult to censor the Internet than it is to censor radio stations or to censor a traditional newspaper because with the traditional newspaper, you can just basically shut down the means of production and the same is true for a radio station. As a government, you can get the people off the air. But, because the Internet is the distributed medium, and because most governments and most economies have a strong interest in having Internet access as they modernize and develop their economies further for the 21st century, it’s hard to shut that down. So, the question is: what will Internet freedom look like in Cambodia in a period in which the government has much more concerns with too much public criticism? We don’t really know yet. We see individual arrests. We see the government’s being responsive and critical; we see the government is being critical of particular individual critics on the Internet, but we haven’t seen an effort to shut down Facebook yet. As Cambodians know, Facebook is often the first platform that they use for connecting with each other over the Internet. And the other channels for connecting on the Internet are often direct messaging apps like Signal and Telegram. Those are still operating. There has not been an effort to shut those down yet. VOA: If you look at Cambodia now where Prime Minister Hun Sen himself has been using the Internet especially Facebook extensively to convey his political messages to voters, is there a reason why the Cambodian government is likely to suppress freedom on the Internet too? Godwin: I think that the government and certainly Prime Minister Hun Sen correctly recognized that Facebook and the Internet generally are really good platforms to deliver their messages and they don’t want to stop that. In fact, they would like to encourage it and I know the prime minister has many, many followers on Facebook and if I were a Cambodian citizen and I spoke Khmer, I would be following him too. So, I don’t see a risk of what you might call a kill switch effort where you want to turn off all Internet access. Not just because the government wants to use the Internet to speak to citizens, but also because the economic damage of shutting down the Internet would be terrible for a country that is trying to develop its economic strength as rapidly as Cambodia now is doing and that is also trying to develop partnerships with other Internet-using-countries in the region. So, I’m not worried about a complete Internet shutdown. It’s really a different proposition from shutting down a newspaper or shutting down a broadcast radio station. It would be as if you blew up all the roads. You certainly can destroy all the roads or you certainly could cut off all the telephone wires and shut down telephone services altogether. That’s a thing that a government could do. But, the loss would be so terrible that I don’t believe the current government or any government in Cambodia would do that now. 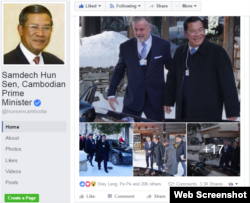 A screenshot of the official Facebook page of Prime Minister Hun Sen.
VOA: So, the concern by some people that the Internet in Cambodia could be shut down or suppressed is unfounded? Godwin: I think that it technically could be done but by the time a government thinks about destroying or shutting off infrastructure to that degree, something else has already gone terribly wrong that may be bigger than the Internet. And you would see that is coming. You would know that terrible thing; it happened. Some governments have sought to try to have that kill switch to try to enable a government-ordered quick shutdown of the Internet. That has been less successful. We have some records in the Arab Spring, where Arab countries, where governments there try to use a kill switch to shut down Internet access. They have some success with that, but what happened is of course people immediately said ‘where is my Internet?’ and they come out in the streets and governments don’t like it when everyone comes out in the streets to find out what’s happening. It makes them nervous, so that’s typically not a productive approach. ​VOA: But you said you are concerned that some particular individual accounts might have been targeted? Godwin: Right, I am concerned. I followed and I read the Phnom Penh Post and of course I was reading the Cambodia Daily and my friends who provide independent media sources in Cambodia. I try to follow them as closely as I can. And I know certainly there are some arrests and some other critical responses of government to different criticism. I’m worried about individuals a lot. So, I think the challenge now for Cambodian people is to try to communicate to government in ways that don’t get misinterpreted as an effort to overthrow the government. I mean I think the government has made it quite clear that they are concerned with what they said especially in the last year that they believed there are efforts to overthrow the government or to create a ‘color revolution’ in Cambodia and I think that put everyone in a position, even if they are trying to be helpful, of worrying about being perceived as a critic and being perceived as potentially part of what the prime minister says is a conspiracy. VOA: You mentioned you’re concerned that certain individuals especially those critical of the ​government may be targeted. Do you see the trend will continue in the run up to next year’s parliamentary election? Godwin: Yes, I think there will be an increasing trend of the government to look very critically and to be more aggressive in responding to political criticism in the run up to the 2018 election. My belief based on the people I talked to in Cambodia is that the government does not want a repeat of a closer election and they don’t want a repeat of the civil unrest or protest and they hope that if they are actively discouraging political dissent, that would make the protest less likely to happen. I think that’s a mistake. I think in fact the efforts to suppress dissent probably will not work as well as they had hoped because what they may have the effect of awakening citizens to their unhappiness about seeing their friends or their leaders in their province or their cities being criticized or arrested. I think that often wakes people up and makes it more likely to be critical of the government. So, if you look around the world, you see backlash against governments that take these steps sometimes and, in this Internet age, the fact that people have many technological tools to stay in contact with one another makes it a lot harder to suppress dissent. So, one of the things we have to remember is that every smartphone that people carry around is serving as a little computer and a little broadcasting station and a little radio station, so you have ways for people to stay in contact with one another and to share information and they all are cameras too. They can photograph things that maybe not everyone wants to be photographed. So, that’s something every government in the world has to deal with including the government of the United States. We have to deal with the fact that if police act badly, there is a very good chance that will be photographed acting badly, so efforts to try to suppress that criticism of government or criticism of government officials or police often backfire. VOA: Do you think the government will revive their scrapped draft cybercrime law? Godwin: I think it’s entirely possible that the government will attempt to revive the cybercrime law. There was a lot of criticism about the law not just within civil society in Cambodia but also internationally, but at the same time the government was smoothing it, the cybercrime law. The government also initiated and successfully passed LANGO (Law on Associations and Non-governmental Organizations) and it seems clear to me and clear to other observers that the CPP [Cambodian People’s Party] and Royal Government of Cambodia believes that or has decided to say that NGOs are somehow causing political unrest, so we’re going to control NGOs. The LANGO has turned out to be a very powerful tool, as we had expected it to be, for driving some independent voices out and I think the only question that remains is how the international community looks at what happened in Cambodia and there really are two primary sources of critical response to this effort. One of them is the United States, which maybe will not be so engaged with Cambodia going forward and the other is the European Union. And the European Union, I think, continues to be committed to trying to encourage Cambodia to move in more democratic directions. VOA: Can you give any specific examples of what the international community can do to make sure the Cambodian government is not able to control the Internet? Godwin: Well, at the end of the day, the international community is not going to be able to stop a Cambodian government that is committed to controlling political speech on the Internet. The only thing that really ultimately would stop it is if citizens find ways to communicate to the government that we don’t want you to do that. This will create more problems than it solves. My belief is that there is a lot of history of people in different countries waiting for the rest of the world to wake up and help them, but I think sometimes that’s too long a wait. So, what you really need to do is think about you and your concerns if you’re Cambodian citizens, how you will be responding as these efforts go forward. I have to say that one of the things that is helpful is to try to be open to all voices and all parties in government so you don’t just say well I support the CPP or I support the CNRP [Cambodia National Rescue Party]. What you do is try to have dialogue with people in both parties or in any party to try and say “Look, these are the problems. This is where we need help. Here, I can help doing these things. How can you help us in our province? Or how can you help me and my business do this thing?" And you have these conversations with everybody. The Internet is really good for that. If you ask for help instead of criticizing people for not helping, it turns out to be more positive. If the feeling ultimately is that the government finds that the Internet access helps government do its job, then they’ll have a more positive view about Internet freedom. Note: The interview has been edited for length and clarity.